Then came the tiny little hiccup. I could not find vine leaves in any shop, anywhere. Not the general supermarkets, and not the more elite shops that have the posh stuff. Even they only had stuffed vine leaves tinned or fresh in the antipasti section. I have to admit that rather deflated me. I had been looking forward to my foray into the world of the culinary unknown. 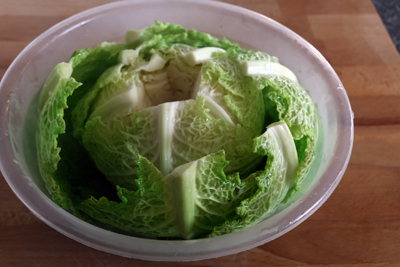 However, I soon pulled myself towards myself and picked up the dark green plan ‘b’ cabbage and headed for the checkout. I had already decided that I wanted to go with a lamb filling rather than beef, so I was already committed on the filling front. The filling was tasty. Lamb mince, pinenuts, risotto rice, mint, parsley, dill, chilli, salt & pepper. So the filling was great. The leaves and the wrapping was where I ran into my little kitchen demon of difficulty. You know the one. The evil little creature who oversalts your dish, or takes the garlic out of the pan that you had definitely put in, or makes your usually deft hands turn into two bumbling, confused idiots. Him. 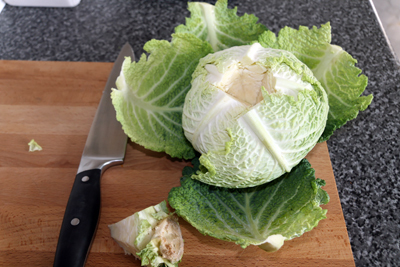 So needless to say, under the less than helpful influence of my little demon, I was not very successful in making my cabbage leaf and filling combination into pretty, neat little rolls. There were maybe a couple that were not completely hideous, but they were not up to my usual standard, and I was not completely happy with them. However, they did taste nice. 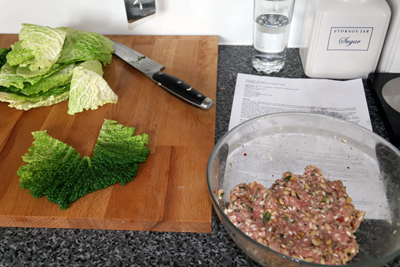 Sort of a combination between a brussel sprout and what the English call a Lamb Kebab. 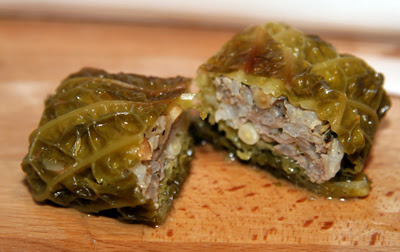 But it was fun, it was a new taste, and I now have a good reason to try them again, once I manage to find vine leaves! Heat the oven to 150C/gas mark 2. Snip the stalk from fresh vine leaves. Drain preserved ones. Spread them out in a large bowl and pour boiling water over them, making sure the water penetrates the layers, and leave to soak. Fresh leaves need 5 minutes, preserved 20. Drain. Rinse the rice, cover with boiling water and leave for 5 minutes. Drain and shake dry. Trim and finely chop the onions. Chop the parsley, dill and mint. 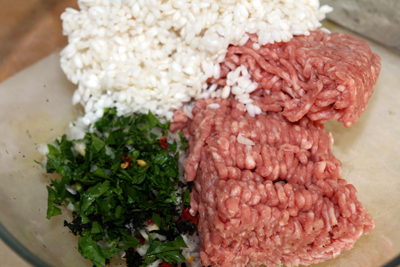 Place rice,onions, lamb and herbs in a mixing bowl. Season with salt and black pepper. Mix thoroughly. Place a scoop of filling — exactly how much depends on the size of the leaf but remember the rice will swell as it cooks — at the base of the spine. Fold the base “wings” up over the filling, then the side wings to the middle and carry on rolling upwards, tucking the sides of the top part of the leaf as you go, to ensure that the package is secure. Make sure the final join is underneath when you pack the rolls snugly in layers — I made two layers in a 21cm by 11cm gratin dish of one-litre capacity. Pour over sufficient stock to immerse. 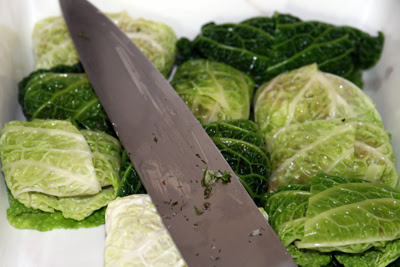 Cover with foil, press down to hold the stuffed vine leaves snugly but not too tightly. Punch a few holes in the top to allow the steam to escape and bake for 90 minutes, checking after 60 in case the stock needs topping up. Ah, I know the kitchen demon well. Your stuffed leaves look gorgeous though & taste is more important anyway. I bet it was lovely with the lamb. Great job and good luck on your quest for vine leaves! Oh yes, that kitchen demon has certainly made more than one stop here… I think you did great, and your stuffed cabbage looks delicious! I hope you find vine leaves one of these days, so you can let use know your opinion of the differences!! The kitchen demon is easy to banish practice practice practice is the answer and calling a mishap something else is always a neat trick. Lovely photograph. Cheers from Audax in Sydney Australia. Yes, the demon. He is my nemesis. Also, I understand how deflated you felt – I love trying new things, but realizing you can't find an important ingredient can be a bummer. Good job making it work, and being creative with it! « Biscuit Joconde Imprime & Entremets – What a Mouthful!